I’m quite annoyed with Izy Hossack, because she’s much younger than me, has a fantastic cookbook and is very gorgeous. Anyway, kudos, whatever. As she introduced me to this chocolate cake (published in Times Magazine I NICKED THIS PICTURE FROM THE MAGAZINE SORRY) which (like my salted caramel recipe) is one of those that makes your guests think you’re so f**king amazingly talented that it’s a shame to ruin that illusion by admitting how easy this chocolate cake is. It tastes like gooey brownie-mousse-stodgy gooey chocolate cake, is completely and utterly delicious, and takes 5 minutes to put together. I tend to weigh all the dry ingredients (and the eggs) into a bowl together before guests arrive, cover it with a plate/cling film, then after the main course turn on the oven, melt the butter and chuck it in then. It’s best when very slightly undercooked and gooey. Serve it with creme fraiche to cut through the chocolatiness. I have no idea what makes it Swedish unless of course Swedes are famous for making the world’s best dinner party pudding, in which case there’s your answer. 1 Preheat the oven to 180C/Gas 4. Line, grease and flour a deep 18cm cake tin. Melt the butter in a medium saucepan. Remove from the heat and stir in the rest of the ingredients. Pour the mixture into the tin and bake for 20-30 minutes – it should be set around the edges but still gooey in the middle. 2 Cool in the tin for about 20 minutes, then run a blunt knife around the inside edge of the tin to loosen it. Turn out onto a wire rack, dust with icing sugar and serve warm. I first made this on Pancake Day 2012 (PCD 2012), which my friend and wonderful ex-flatmate (before she left me for a MAN) Seil and I co-host every year, and normally we do a Practice Pancake Day during the winter some time too (PPCD), because a year is too long to wait between pancake feasts. Anyway in 2012 I reached the peak of my creativity and came up with the idea of a new pancake filling: DECONSTRUCTED APPLE CRUMBLE PANCAKE. Apples cooked down with some butter, crumble cooked solo on a tray until crispy (my Mum’s crumble recipe uses porridge oats and brown sugar and a lot of butter and is insanely good), then wrapped up in a pancake and served with ice cream, and salted caramel drizzled on top. Our 14 guests went absolutely loopy and it’s been a PCD and PPCD menu staple ever since. 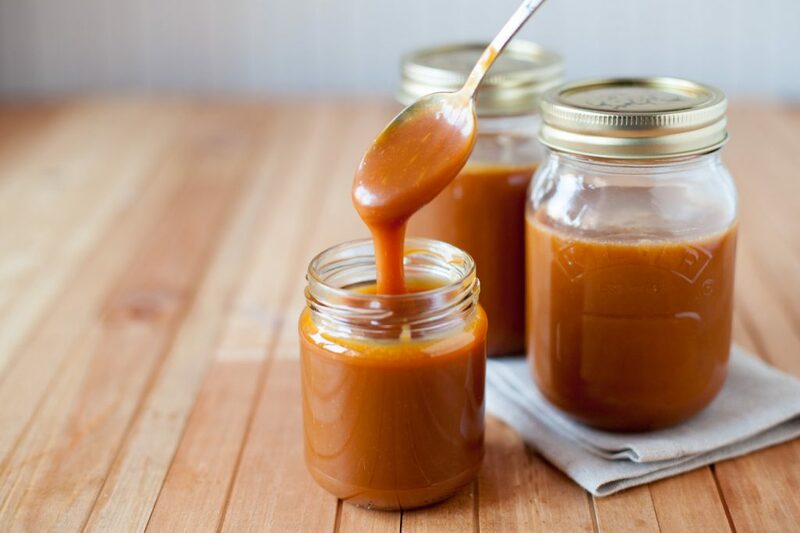 I now make two or three times the recipe so that our friend Alice (who definitely only maintains our friendship for the salted caramel – she is a woman obsessed) can take a jarful home. The only thing is, is that I’m almost loathe to post this recipe up, because then everyone will realise how easy it is, and then they won’t think that I’m some sort of amazing genius who can whip up salted caramel sauce at the drop of a hat any more, and I like it when my guests think I’m an amazing genius. Anyway, FINE. Here it is, with enormous thanks to Nigella Lawson for making me look brilliant. Sorry if the easy access to salted caramel makes anyone very fat. Nigella reckons one serving will serve 6! She’s made. It will serve 3, maybe 4. She also originally suggests 1 tsp fleur de sel. I use Maldon, and generally add rather more than she says. Add gradually, to your taste. Melt butter, sugars and syrup and butter in a small heavy based pan and let simmer for 3 minutes, swirling every now and again. Add cream and half a teaspoon of fleur de sel salt (not table salt!) and swirl again, give a stir with a wooden spoon and taste – go cautiously so that you don’t burn your tongue – to see if you want more salt before letting it cook for another minute on the stove, then pour into a jug for serving. Eat it on its own, over ice cream, or on an appley dish. Last night I had a dinner party and made the mistake of serving it with brownies AND ice cream. Big mistake – far, far too much sugar at one time. Lesson learnt: don’t be such a greedy cow/sometimes less is more/sometimes the sum of two parts is better than the sum of three, etc. I did this pudding (less healthy, but easy, impressive and cheap so at least those boxes were ticked) for four people, and it was easy as pie – Millefeuille with vanilla cream and English strawberries, but looked like I had spent hours on it. In fact, I woke up half an hour early, whacked the oven on, had a quick shower, rolled out the ready roll puff pastry (it is neither cheaper nor better to make your own – do not bother, unless you don’t work and are very bored), and popped it in the oven. The idea came came about because I was editing the Weekend food pages that week, and we were doing Rachel Khoo’s seasonal cherry recipes (www.thetimes.co.uk/tto/life/food/recipes/article4150539.ece). I slightly adapted the roasted cherry millefeuille recipe (www.thetimes.co.uk/tto/life/food/recipes/article4150609.ece), mainly because I didn’t have time to faff around with roasting cherries, so bought some strawberries instead. Raspberries would also work deliciously, as would blueberries mixed with peaches… etc. 1. Preheat the oven to 180C. Line a flat baking tray/baking sheet with baking paper. Unroll the puff pastry and cut it into 12 rectangles. Each one will be about 10cm x 4cm. Place those on the baking tray, equally spaced. 2. Beat the egg lightly and using a pastry brush, brush the top of the pastry with the egg. Sprinkle lightly with caster sugar (about 2 tbsp in total). Place another piece of baking paper on top covering all the pastry rectangles, then another lightweight baking tray or wire rack on top. This will stop the pastry rising too much. 3. Bake for 15 minutes then turn, and check again after 20 minutes. The rectangles should be golden and crisp. 4. Slice your strawberries and keep them in the fridge. Or, use raspberries and then you don’t need to slice a thing. 5. Split the vanilla pod in half, and using the back of a knife, scrape out the tiny black seeds. Add them to the cream and then whip the cream into soft peaks. At this point, some people add sugar, others add curd. I’d rather keep it simple and not too sweet. 6. When the cream is whipped, the strawbs/raspberries prepared, and the pastry rectangles cooked and cooled (do them the night before or in the morning and they’ll survive very nicely), assemble the millefeuille. Each person gets three, filled with cream. Don’t bother trying to make it look like you’re in a French patisserie, just put one pastry layer, then a nice big splodge of cream spread over the layer, some strawberries, then another pastry layer, then more cream and more strawberries (if you put too much cream in it’ll look more impressive but will squidge out everywhere when you try to cut into it – your choice), then a final layer of pastry. 7. Take a tea strainer or tiny sieve, put some icing sugar in it, and shake it over the millefeuille and the plate on which it sits, then decorate with a piece of lavender, sprig of mint, or tiny Santa Claus/Easter bunny/bride and groom – depending of course on the season and occasion.